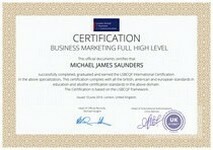 For printed certificates see the International Certification section below. 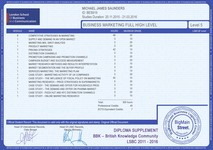 The Certificate Supplement or the Official Transcript of your diploma is the official document issued by BigMainStreet/London School of Business and Communication that includes the competencies and the knowledge units of your course, the transferable professional credits, the ECTS equivalent credits and other important information about the course. You can download it for free from My Certificates section. If you want a printed version with the official stamp or seal, the fee is $23. 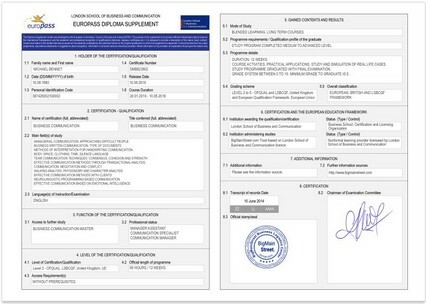 The Europass Supplement is the official document issued by London School of Business and Communication that includes the competencies and the knowledge units of your course and the official educational framework reference. This supplement is mandatory for european students and useful for the students from all the other countries. You can download it for free from My Certificates section or you can order a printed version with the official stamp or seal and the fee is $18. 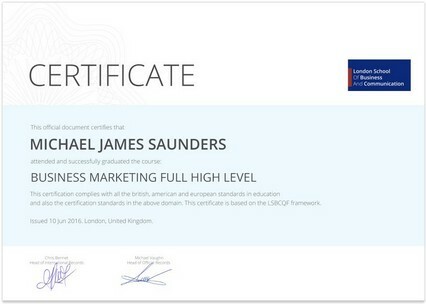 For example, The International Certification in Marketing certifies the marketing knowledge, the competencies units that you acquired and the compliance of the learning system with the international standards and regulation for education + the international standards in marketing education. The International Certification is a premium service and comes as a printed and officially registered golden certificate and has the signature and the official stamp of the Head of Official Records from London School of Business and Communication. You can order it from My Certificates section and the fee is $38. Only the Graduation Certificate is included in the cost of the course, as a standard service. This certificate comes only printed with the official stamp and registration and the fee is $28. YES, WE DELIVER THE CERTIFICATES ALL OVER THE WORLD. For orders over $70 you qualify for Free Standard International Shipping. * Delivery times may vary depending on each country. The prices are calculated for each country (starting with $2) at check-out.